My Kind Of Introduction: 11 Classic Games to Help Enhance Your Child's Math Skills on #FamilyGameNight! 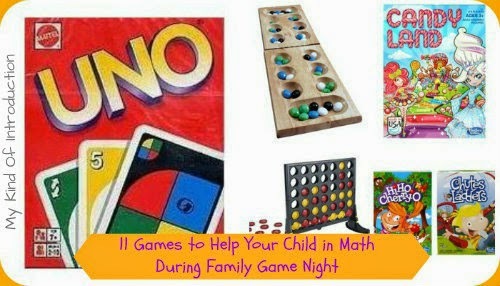 11 Classic Games to Help Enhance Your Child's Math Skills on #FamilyGameNight! Turning Family Game Night into a Math filled Learning Experience! Family Game Night can be much more beneficial to your family then you realize and could turn out being one of the best additions to your family schedule! Everyone knows that spending time together as a family and playing a few games is great for family bonding but not many people realize how educational your favorite board/card game can be as well. So many of today's most popular games, secretly have the ability to help kids with skills such as math, spelling, reading comprehension, colors, patterns, storytelling and so much more!! There's no since in spending hundreds of dollars on high-tech learning devices when you already have the learning materials your child needs to practice to enhance their brains. Games like Uno and Connect Four can almost always be found in the family game closet and are great choices to help practice numbers, colors as well as patterns! My fiance and I try and fit in a Family Game Night every now and then with the kids and now that the girls are back in school, games packed with "brain juice" get grabbed first! Nothing's better than a good dose of educational fun! Speaking of educational fun - I've listed a few of our favorite games below that help kids exercise their brain using math skills and enjoying every bit of it! Other games that can be used for math practice but are not found in the list below are Yahtzee, Set, Monopoly and Battleship. Family Game Night games that can be used for enhancing other important skills can be found in future lists that I'm currently putting together and plan on sharing with you all very soon! Check back often for new lists and game additions. Uno was one of my favorite games as a kid and still makes the top of my list today! It's a game that the whole family can enjoy without boredom. Played with 2-10 players - For ages 7 and up - Children get the chance to practice their strategizing and planning plus a bit of addition as well. The younger players can partner up with parents or older siblings while practicing to recognize their numbers as well as colors. Find Origial Uno Card Game for just $5.94 at Diapers.com and Save 20%! Mancala is an addition filled game where you count out your marbles into game slots while trying to clear your side of the board of any marbles. Players also practice their problem solving while planning their next moves. Candy Land is already an outstanding game to help with learning colors and is often played by more girls than boys - Not any more! - You can now easily transform this all time favorite board game into a Math game as well! All you have to do is make up a few math sequences to attach over-top of Candy Land's colored square playing cards. Have each player choose a card and either identify the number, say the number word or find the sum of a simple "add or subtract" math problem to move forward. Removing the "bridges" help slow down the winning process and stretch out the learning! You can continue to use the color blocks on the cards to distinguish where to move next on the board or use the number answer found on your newly enhanced playing cards! The choice is yours!!! HiHo! Cherry-O is a fun game for children as young as 3 years old but is great for any age! Loved by everyone, the concept of this 2-3 player game is to compete with other players while trying to be the first one to pick all the fruit off their trees! Great choice for help with counting, addition and subtraction as well as number recognition! Purchase the Hasbro - Chutes and Ladders & HiHo Cherry-O Combo Pack for just $12.9 at Amazon.com Marketplace!! Chutes & Ladders helps teach your child how to count while adventuring through the many slides and ladders in this math filled family favorite! Rush Hour is a one player game that's not only portable but fun and challenging as well. A problem solving game played with a small board that's full of vehicles that have set directions in which they are allowed to move. The goal is to arrange the vehicles in a particular pattern in order to drive the ti red car out of the traffic jam. Every game piece is important so be sure to keep up with all of the pieces. It's small enough for children to set on their lap which makes Rush Hour a perfect choice for waiting rooms, car trips and so forth. The all american game is "Go Fish" can help kids with recognizing their numbers and a bit of their colors as well. Poker is also a good teacher for math but should be kept for older kids and must first be taught that gambling is not something to be think lightly of. Sumoku is a math-centric game for 1-8 players (ages 9 and up) and is somewhat of a number version of Scrabble as well as a little bit like Dominoes. Play by adding to the existing layout of tiles - based on a specific mathematical goal. Along with practicing basic computational skills - players are also planning and matching. There is no speed element so young kids can take as long as they need to check their math before placing the tiles on the board. Rummikub is a color and number matching game for 2-4 players. Each player receives 14 tiles that can be sorted by groups or runs: Set of 3 or more tiles of the same number but different color - OR - Set of at least 3 tiles with consecutive numbers but are the same color. You can find Rummikub at Target.com for just $10.59! Can you easily transform the game into a fun learning experience? This post contains affiliate links provided by Postpresso. These are all great games that make learning fun. Kids dont realize they are learning.